In the spring of 2007 the Foundation was created by Frederic Lowen, son of Dr. Alexander Lowen. It has since become a resource center for students, practitioners, teachers, and interested individuals who seek to learn about Dr. Lowen, Bioenergetics, and body-psychotherapy. In essence, Bioenergetic Analysis is based on the energy and the energetic processes of our bodies and our lives. From the psychotherapeutic and laboratory energy work of Wilhelm Reich, Alexander Lowen developed methods and concepts of work with energy that continue to be state-of-the-art. Form, movement, and expression of the body, and psychological constructs of the unconscious, resistance, conflict, etc. are best understood energetically, as well as psychologically and physiologically, in healing work. Bioenergetics works with the body's energy psychologically, physically, and physiologically to accelerate, deepen, and integrate therapeutic outcomes. Energetically, Bioenergetics recognizes that the fundamental issue underlying psychological disorder, stress, and anxiety is a disconnect between mind and body, between thinking and feeling. This disconnect — the mind-body split — is pervasive, widespread, and little recognized. In addition to cognitive , behavioral, and psychodynamic theory and techniques, Bioenergetics resolves personal conflicts and enhances aliveness and quality of life. With a focus on feelings, emotions, and the energetic charge of the body, healing the mind-body split occurs as feelings and thinking are integrated. “Grounding, Breathing, and Vibration are three basic Bioenergetic principles. A person who doesn’t breathe deeply reduces the life of her/his body. If one doesn’t move freely, the life of the body is restricted. If one doesn’t feel fully, it narrows the life of one’s body. And if self-expression is constricted, the life of the body is limited. A person does not have a body, a person is a body.” — Alexander Lowen, M.D. The mind-body split is best described energetically rather than psychologically and physiologically. It is the core condition creating the irrationality and social dysfunction so prevalent in the 21st Century. The great problems of modern society are fundamentally psychological and energetic. They will not be resolved by political, economic or technological solutions without the psychological and energetic understanding of the mind-body split. Irrationality is a result of the mind disconnected from its feelings. The focus of the Lowen Foundation’s work is to recognize, educate, and heal this mind-body split in individuals and society. It is essential to healing societal dysfunction. More than any other profession, psychotherapists are charged with tracking their clients’ whole reality. Psychotherapists uniquely have the responsibility and the opportunity to understand and speak to the socio-political economic irrationality and insanity that pervades 21st Century culture. • Online Learning & Therapy for professionals and individuals interested to learn Lowen’s classic Bioenergetics and integrate it into psychotherapy. • Publishing and growing the availability of Dr. Lowen’s books in print and eBooks in more than 15 languages. • Archiving Dr. Lowen’s published and unpublished writings, personal files, photos, audio and video recordings from over 60 years of clinical work. • Creating workshops and presentations to advance Lowen’s classic Bioenergetics into the 21st Century and make it more accessible to people around the world. Alexander Lowen, M.D. (December 23, 1910 – October 28, 2008) was an American psychotherapist and father of Bioenergetics. A student of Wilhelm Reich, he developed Bioenergetic Analysis with John Pierrakos and founded the International Institute for Bioenergetic Analysis (IIBA). His clinical work has led to insights that have become mainstays of modern psychiatric understanding and psychotherapeutic practice, he has inspired and influenced many body-psychotherapy modalities. Dr. Lowen's innovative approach views the feeling connection with the body as an essential component of overall health. Bioenergetics focuses on helping people reconnect with their bodies. He was the first psychotherapist to have patients stand on their feet, and he pioneered numerous exercises for releasing chronic muscular tension and accessing repressed emotions. Dr. Lowen authored 14 books, translated to more than 15 languages. His books were well received and continue to be published worldwide. He also wrote numerous articles and other professional publications, and established the Journal for Bioenergetic Analysis. Over the past decade, we have seen the interest in Dr. Lowen and his work grow stronger than it has in many years. The Foundation is a part of this resurgence and seeks to reach the worldwide body-psychotherapy community to advance Dr. Lowen’s contributions to psychotherapeutic practice and science. TALF relies on private donations and need strong community support! 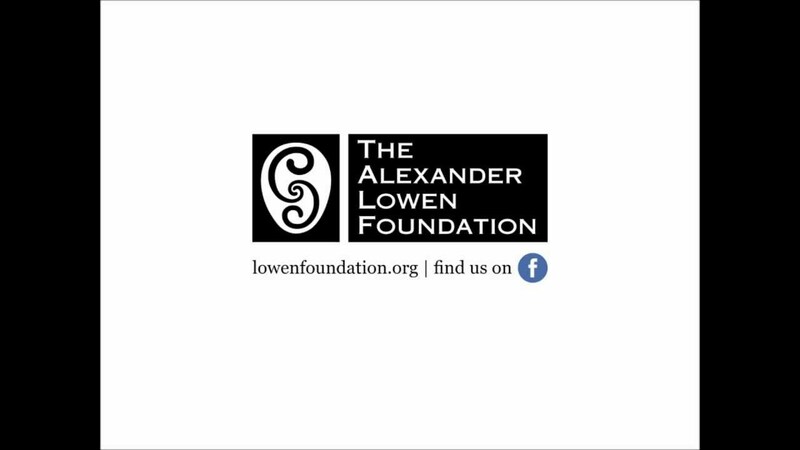 We always welcome volunteers and depend upon donations — 100% of the proceeds go to support The Alexander Lowen Foundation. We invite you to visit our website www.lowenfoundation.org where you can explore our media, education, and other sections. And please keep in touch by signing up for our newsletter and following us on social media.